Here is the calendar of events for this year where you can see The 2nd York in action! Re-Enactors should contact the company officers and officials for the optimum time to arrive at the encampment. Of course, visitors and general "audience" should attend as of the official start times only. Although we do try to keep this calendar up to date, some dates and events can be changed or cancelled with little notice. Copyright © 2019 Thompson's Coy. 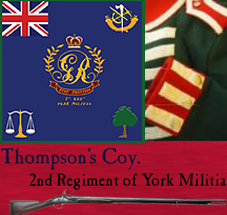 of the 2nd York Militia Rights Reserved.